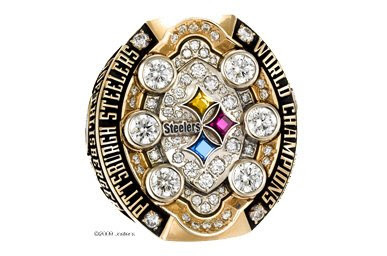 Here's a look at the reward the Pittsburgh Steelers received for winning Super Bowl 43 - a ring that comes in at 3.7 ounces, containing 63 diamonds that go 3.61 carats. The rings were awarded at a ceremony held at Heinz Field's East Club Lounge last night, which had its starting time moved up to 6 PM since so many Steelers had tickets to last night's Pens-Wings Cup game. Good idea - the ceremony was slated to run until 11 PM. It was a nice day for the defending champs, who had practice canceled by coach Mike Tomlin. Instead, Tomlin arranged to take the team bowling, continuing a tradition he started last year. The team has practices lined up for today and tomorrow and will return to town July 31 to start training camp.